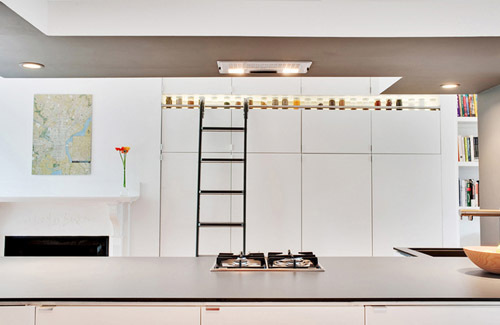 Unbelievable as it is, this is an ikea kitchen by the brilliant architect Chris Greenawalt from Bunker Workshop! The far two cabinets rest on casters and slide out from under the countertop to create a bar area. A De’Longhi freezer is cleverly integrated into the island (hidden behind a panel) and cabinets fill in the rest of the length. Trespa Virtuon countertop surface. The space feels open yet defined. Two Fisher Paykel dish drawers as well as a 24-inch gas oven and cooktop and two under-counter fridges by De’Longhi all compacted into the island. The canopy that defines the kitchen area also houses a Broan hood for the cooktop. 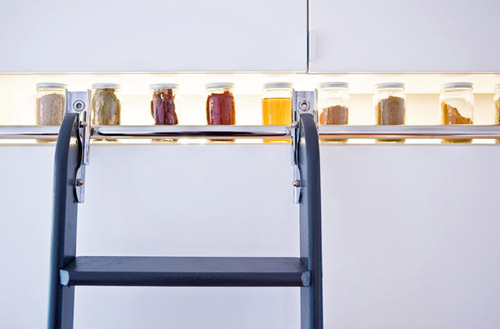 A Putnan rolling library ladder purchased at Restoration Resources, allows access to the spices and upper cabinets. Vigo Industries sink and Cifial faucet. Rust-Oleum chalkboard paint. 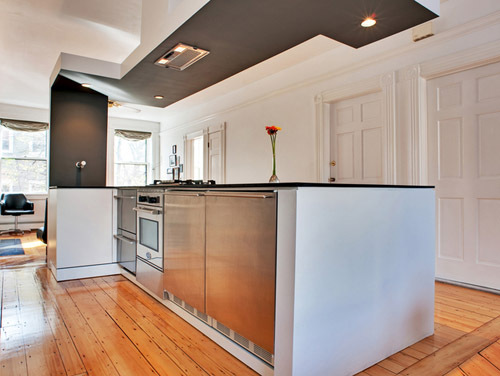 i really want to try out some chalkboard paint – this kitchen is the definition of form follows function. I’m shocked to hear it’s an ikea kitchen- well done. I’m with you on the display nook- such a great detail. I love it. The openness, the chalk board. It’s all just perfect. what a kitchen indeed. beautiful, clean lines, functional and is that a fire place i see? amazing. who lives – and cook! – there??!! That looks amazing…I can’t believe its Ikea – there you go! I love the canopy but I fear the extraction fan won’t be strong enough! I absolutely love the depth of that bench…what is that 1800mm? Brilliant.